In Florence, an unprecedented gathering at "Radical Utopias" - Archpaper.com In Florence, an unprecedented gathering at "Radical Utopias"
In 2014, the micro storefront art cooperative Base/Progetti for Art in Florence launched Radical Tools, a series of speaking events held in their single window facing Via San Niccolò on Florence’s “left” bank. Most of Florence’s historic Radicals showed up to participate, and this event proved that, despite past animosities, rivalries, and other unfathomable differences, the Radical generation could possibly come together at last. From there, the exhibit, “Radical Utopians: Beyond Architecture: Florence 1966-1976,” evolved, though it originally was to open in 2016 to mark the 50th anniversary of emergence of the Superarchitecture movement. But for the usual complications, the exhibit was delayed a year. Perhaps this was a forgivable slip if one considers that there were two debuts for the Superarchitecture movement, one in Pistoia in 1966, and the other in Modena in 1967, and that even those two dates were precariously fixed. The exhibit, nonetheless, is a Florentine first, as up till now, no one was ever able to bring all these main players into the same space. It is also likely that this won’t happen again. The curators, Pino Brugellis, Gianni Pettena, and Alberto Salvadori, with Elisabetta Trincherini acting as curatorial coordinator, faced a heap of criticism for daring to shake up conventions, separating the group’s sacrosanct works by themes, eroding in the process the hierarchies that had been persevered among them. But there were many, like myself, who feasted on this splendid eye-opening smorgasbord of projects, objects, films and other Radical life accessories. 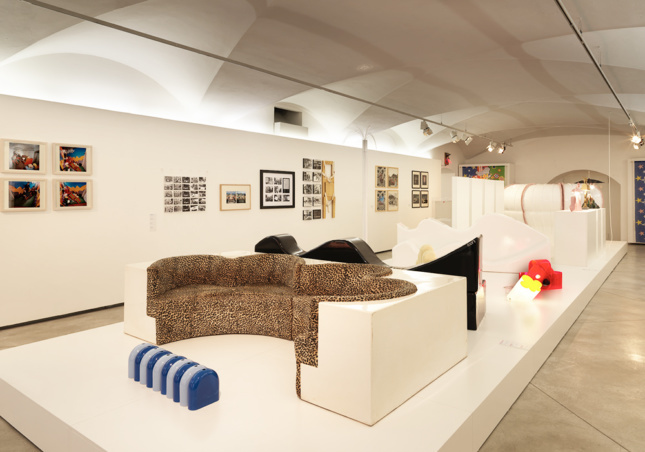 After all, this assembly of Florentine Radicals: Superstudio, Archizoom, 9999, UFO, Zziggurat, Gianni Pettena, and Remo Buti, in their native home of Florence, with works collected from group and individual archives as well as from private collectors, manufacturers like Poltronova, and major museums like the Pompidou Center, represents an impressive curatorial feat. 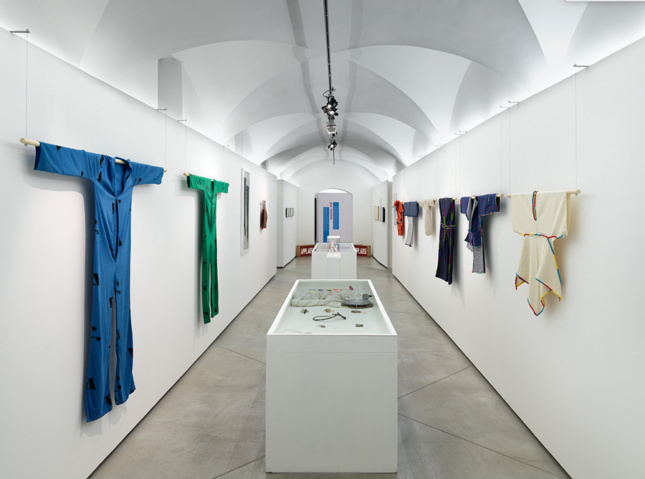 Just to see Archizoom’s collection of clothing, “Dressing Design,” on display, created principally by Lucia Bartolini, with her modular dress patterns intended to encourage the user to be her or his own stylist, or her intriguing “hairy” leggings, promoted by Fiorucci for his fashion collection, are in themselves worth the while. Besides a good number of precious pieces by Superstudio and Archizoom, this is also an occasion to become immersed in the works of the other Florentine Radicals: Gianni Pettena’s images from different cities featuring his first political “statements” using his monumental alphabet, along with his underground films and American land art-inspired house series. Then there are the images of UFO ‘s pre-postmodern semiotic-inspired performance extravaganzas, and most prominently their enormous Colgate inflatable suspended in the Strozzi palace’s outdoor courtyard. Also on view is 9999’s compilation of videos taken of the Living Theater inside their Space Electronic discotheque along with their Franciscan-inspired illustrations for a film never realized. Along with Remo Buti’s original airbrushed renderings of his ideal cities, one can view his important collection of imprinted architecture white ceramic dinner plates. And then there is Zziggurat, whose name is legendary, but whose works are rarely displayed. Here are the most architectural drawings of the exhibit, including their 1969 project “la citta lineare per Santa Croce (the linear city for Santa Croce),” a jagged and immense superstructure that rips through the heart of Florence, programmed with cultural and public activities. This project, as Elisabetta Trincherini pointed out in a recent exhibit walkthrough, could clearly have inspired Rem Koolhaas’s 1972 Exodus, or the Voluntary Prisoners of Architecture. As Andrea Branzi once remarked, this was a generazione esagerata, or an exaggerated generation. These no-holds-barred Radicals lived in the same city, frequented the same university, and mounted the same barricades. Their incredibly fertile years of invention and re-invention have made an enormous mark on our common psyches, whether we are ready to acknowledge their contributions or not. But this is a chance to immerse oneself in their world. If you can’t make it to Florence before January 21, there is a catalogue by Quodlibet Habitat, sold in Italian and English editions. This might well be the most up-to-date and comprehensive publication yet, and will certainly serve as a useful Radical primer. 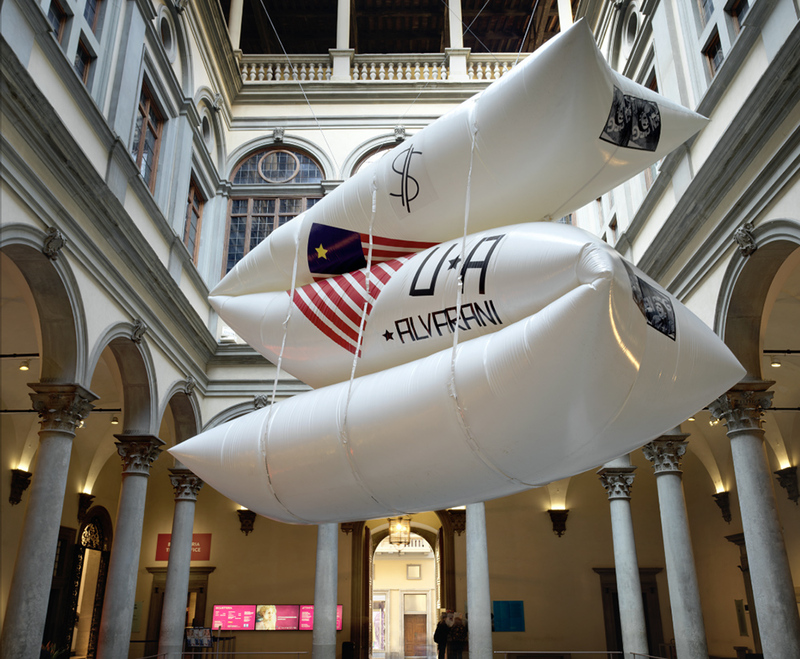 “Radical Utopias” is on view at Palazzo Strozzi in Florence until January 21.